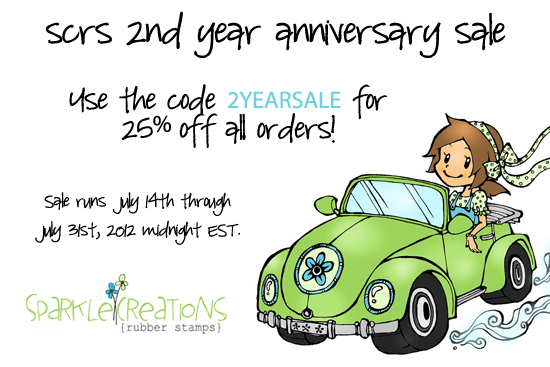 Hello and Welcome to Day 3 (of 4) of previews for the July release for Sparkle Creations Rubber Stamps! We're also celebrating our 2nd anniversary, and Sparkle is releasing 4 new images this Saturday! 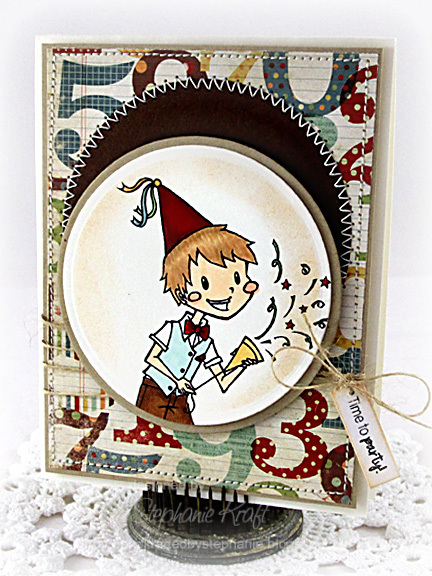 Today we are previewing a new SCRS image, Party Time Oliver and sentiments, "Time to party!" and "It's your birthday!"! I stamped and colored Party Time Oliver and cut out a "spotlight" portion of him. I paired him with some fun patterned paper from the Happy Day (Simple Stories) collection. Be sure to visit all rest of the SCRS designers for more peeks of Party Time Oliver. Sparkle will be giving away a Party Time Oliver to one lucky person! For a chance to win, you need to comment on all of the designer's blogs (list below). Then head on over to the and comment on the Oliver post. You have until midnight EST each day to comment. The lucky winner will be announced the following day! More of the team will be previewing the final image tomorrow, and we will have a big blog hop with the entire team and SCRS friends the day after. Thanks so much for stopping by! Accessories: Standard Circle Nestabilities - SM and LG (Spellbinders), Die-namics Mini Wavy Pennants (My Favorite Things), Markers (Copic), Twine (May Arts) Foam tape, Thread, Sewing machine. Adorable card Stephanie! Love your fancy stitching and the cute tag! The numbers are a great background. Great stitching!!! nice card,stamp of boy looks great in round die. this is so cute, love the new image. Super cute!! Love the fun stitching and Party Time Oliver!! Very cute card-- the stiching looks GREAT! Really like how you used the Oliver image and the stiching and Number themed DP! :) Looks great! You win the award for the cutest card I've seen today! I love it so much! Great work! I really love this little cutie! I may have to indulge in a little SC! !